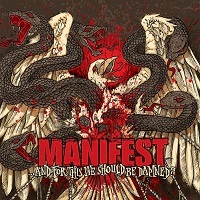 MANIFEST is a Norwegian Groove Metal band formed in 1999 and having already released three full length albums and lots of demos they now unleash upon us their latest full-length effort entitled "…And For This we Should Be Banned". This album was recorded live in studio by producer Hakon Gebhard and the idea behind this was to capture the energy, rawness and vibe like on tape - a genius idea and the result is an aggressive and underground album; a mix of Groove and Thrash. The first track "Seven Doors Won't Do" starts off very slow with deep and sad vocals and cool riffs and catching rhythms, and then the vocals become more aggressive and the tempo gets faster and that is carried on into "Stretched & Strung" 's raw-sounding and total chaos. The idea of recording live in studio does pay off indeed, excellent guitar work and bass lines. "Violently Engaged" sounds like a mix of old SEPULTURA and ENTOMBED; featuring a very catchy chorus with some distorted and very heavy solos. "Sancta Venere" follows the same path: the vocals are all over the place and drumming is also quite good; lots of tempo changes and noises on the background. "The Cadaver On Your Mental Doorstep" shows what MANIFEST is all about, as this song is very complex with lots of changes, at times the vocals sound like Warren Dane (SANCTUARY); deep and melodic, and other times like MY DYING BRIDE; low and heavy - great stuff indeed! "Justified Means" is the shortest song on the album and also the fastest; hitting you with some old school European Thrash with full force straight in your face! "Immune" is more Thrash, sounds like DECEASED, and the solos are incredibly good and the vibe is unique - my favourite track for sure! "Burning Brimstones" a bit slower but quite aggressive; I really like the way this album was put together with a touch of SLAYER in the riffs - nothing wrong with that - which here makes for a very cool song. "Sincerely" kicks asses with its heavy and aggressive focus that goes from slow to really fast - another killer song with lots of things happening. The last song and also the longest: "Olympia Cathrin" brings to the table a more slower approach but also very heavy with the vocals singing and screaming like a maniac and the arrangements for this song are very complex and very cool. The production is excellent, the artwork is cool, the songs are killer and the whole experience is just.. masterful!